Rakhi Sawant will lead the 'Chillar' Party' in the uniquely conceptualized new reality dance show on 9X, Yeh Hai Jalwa.. It seems reality shows and Rakhi Sawant go hand in hand. After Big Boss and the entire Nach Baliye 3 fracas (where this item girl accused the STAR network of manipulating votes to make Sanjeeda and Aaamir win) she is back with 9X’s, Yeh Hai Jalwa. We caught up with Miss. Controversy for a chit chat on the reasons for returning to reality television, the format of current show and the Rakhi-Abhishek Valentine's Day episode. Why one more reality show? I have to run my house, pay the car installments and drivers' salaries. Star has still not payed me Rs 33 lac for my Nach Baliye efforts. They first want me to apologize and then only will they clear my dues. Why should I say sorry, when I believe that I did nothing wrong. You will be seen in a movie and events too, isn't it? I agreed to do Rakesh Roshan's Kkrazy 4 for free and other events hardly pay. You will dance with small kids this time around? The format in Yeh Hai Jalwa teams ordinary people with celebrities. I lead the 'Chillar Party' which comprises of kids. Yes that's a very big challenge. We can't even rehearse for many hours, as their exams are round the corner. Plus I also have to do less complicated steps, so that they can fall in sync. Some of the other contestants have housewives as partners. So they have much more time to practice. And elders know how to deal with pressure. So is it unfair that you are tagged with kids? I will not say unfair, but will not term it as fair either. What's your take on the anchors of the show, Smriti Irani and Sakshi Tanwar? Its great to have these gracious ladies as hosts, they will bring life to the show. This show is unique in the sense that there are no judges. What are your comments? Yes, that's a very good thing. We will not need to kiss up to people any more. The audience knows every thing and will choose the correct winner. Yeh Hai Jalwa will turn out to be the best reality show to have ever hit the Indian television screen. Will the presence of on-screen bahus like Prachi Desai and Shweta Tiwari affect your chances all over again? No, what really matters is the call of Ekta Kapoor, who say's ‘make my bahu win’. The channels just can't ignore her demands. I just hope this time, she asks the public to vote for me. What do you think are your chances of winning? It very tough to say! We have very strong contenders like Prachi. Rohit is also a good dancer. I am already getting butterflies in my stomach thinking of the end result. Let's hope the kids pick up enough steam as the episodes start to pass. People think that the entire Valentine Day drama that happened between you and Abhishek was just a PR stunt. What do you have to say? No it was not. Abhishek knew that I would only forgive him if the media appealed to me. If I wanted publicity, as it's alleged, I could have fought with him in front of camera, right? But that did not happen. And let us see it the other way. We gave the audience a different kind of entertainment on V day. Our news even over-shadowed Raj Thackrey's as well!! CONFIRMED! After separation, This Yeh Hai Mohabbatein actor & wife are living TOGETHER again! Yeh Hai Mohabbatein to go OFF-AIR in June, CONFIRMS THIS actress! 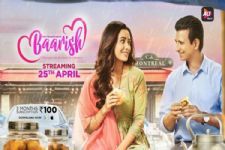 The First Teaser of ALT Balaji's Baarish is the story of romance in the rains; Video Inside! 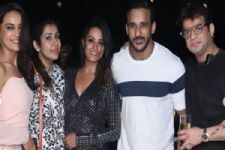 View PICS: Naagin 3's Anita Hassanandani's Surprise Birthday Bash was all parts fun!! Shoba Khote to enter Baa Bahu Aur Baby..
Wow! Rakhi was brave enough to say that Ekta Kapoor pressurises the channel to favour her preferred contestant! hehehe. haha omg are things so bad for rakhi now that she does item numbers for free!!!!! Ekta Kapoor who say's ‘make my bahu win’.??? I thought she wanted to play a bahu in Ekta's serial, now i doubt that will ever happen. Kohl-Rimmed Eyes TAKE OVER Hindi Silver Screen! Is Aishwarya Rai PREGNANT? Asks Twitteratis; PICTURE Goes VIRAL!